All Web site design, text, graphics, the selection and arrangement thereof, Copyright © by Elkabee's Fabric Paradise.com, LLC. All rights reserved. Elkabee's Fabric Paradise.com, LLC, the Elkabee's Fabric Paradise, LLC logo, all product names, and all page headers, custom graphics, and button icons contained on this site are service marks, trademarks, trade names and/or trade dress of Elkabee`s Fabric Paradise. All other trademarks, service marks and companies names or logos cited herein are the property of their respective owners. By accessing, browsing and/or using this site, you acknowledge that you have read, understood, and agreed to be bound by these terms and to comply with all applicable laws and regulations. If you do not agree to these terms, please do not use this site. 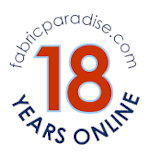 Elkabee's Fabric Paradise.com, LLC makes no representation that this site or its contents are appropriate or available for use in any locations outside the United States. Those who choose to access the site from other locations do so on their own initiative and are responsible for compliance with applicable local laws. ELKABEE'S FABRIC PARADISE, LLC DISCLAIMS ALL REPRESENTATIONS AND WARRANTIES OF ANY KIND, WHETHER EXPRESS OR IMPLIED, WITH RESPECT TO THIS SITE OR ITS CONTENTS, INCLUDING, WITHOUT LIMITATION, WARRANTIES OF MERCHANTABILITY AND FITNESS FOR A PARTICULAR PURPOSE AND WARRANTIES OF ACCURACY, TIMELINESS OR COMPLETENESS OF THIS SITE OR ITS CONTENTS. None of Elkabee's Fabric Paradise.com, LLC, any of its directors, employees, agents or representatives will be liable for damages (including, without limitation, any compensatory, direct, indirect or consequential damages, loss of data, income or profit, loss of or damage to property and claims of third parties) arising out of or related to, and the use of, this site or its contents.